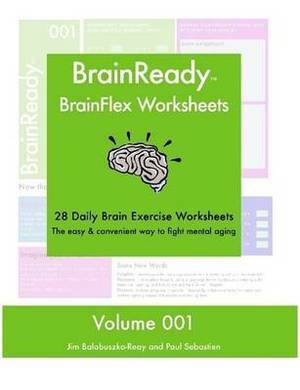 Cross-train your Brain, with BrainReady's quick & easy BrainFlex worksheets! Starting from age 25, our adult brains begin to deteriorate. Now there's something you can do about it: BrainFlex daily Brain Training Worksheets! BrainFlex Worksheets from BrainReady.com are full of easy, innovative exercises to awaken and revitalize your brain, including: Visualization Exercises, Simple Math and Logic Problems, Creative Projects, and Memory Challenges Each of the 28 daily worksheets is a 10-15 minute workout to help you start your day, or dust off the cobwebs anytime! So grab a pen and get ready, it's time to cross-train your brain, the quick & easy way...BrainReady!